Brenton Toy is the highly respected coach of the Tiwi Bombers. The director of the department’s Transition Support Unit is widely recognised as a talented instructor and sports strategist that opposing teams underestimate at their peril. After leaving school, Darwin-born Brenton moved directly to an AFLNT traineeship, progressed to Football Development Officer, AFL Kickstart State Coordinator, Coach Education Manager, and Northern Territory Institute of Sport AFL Head Coach. Before joining the department, he also worked as a regional Indigenous Sports Program Officer, and as a full-time case worker and part-time youth worker at the Don Dale Detention Centre. “I began with the Bombers as their inaugural general manager when they first joined the competition in 2007, and became coach in 2008,” he said. “I spent some time away from the club, but I returned in 2017 and I’ve been coaching for the past two years. 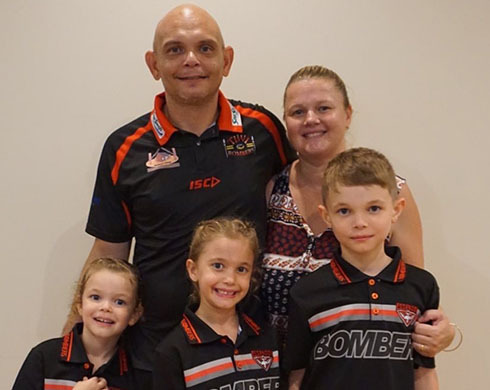 The award winning coach said his ambitions are to help the Tiwi Bombers “stay on track” and work to “positively influence the lifestyle opportunities for Aboriginal people”. “In the Tiwi Bombers we use the game and the club to shape who we are as people,” he said. “Respect, trust, accountability, self-management, resilience, communication, planning, performance management and leadership, are all aspects of football that can be transferred to life. “I have seen the game provide a sense of pride and purpose to individuals, helping them to be more organised outside of football. I have also seen the impact that sport has on the broader community, and in bringing people together. But family is paramount in the life of Brenton Toy. “What I love about my life is that I’m blessed with the most amazing wife and children, and my parents and grandparents have been around to see my children grow up,” he said.